Hats off to my husband, who has spent most of his Labor Day weekend working around the house and helping me with the kids! NO! We don't have a single thing planned, not one place we must be. And I think that's just...glorious! What a blessing of a husband. Also, those pears look yummy! My two older kids went on a Labor Day weekend trip with the grandparents. We have a toddler still, and then my husband and me. We're having a very laid back weekend. If anything, we're going to the mountains. Those pears look yummy!! I just bought some for my family today actually. . . and they. . . are. . . delish!! What a great husband Meribeth! We have just been doing small things around the house this weekend. Today we are relaxing and might go swimming. After the weekend we've had...it will be such a joy to sit home and relax. I've actually decided to take the whole week off - no school and as little day to day stuff as possible! My daughter and I are helping my husband to celebrate his 40th birthday. We are 4 1/2 months new here in TN (moved from CA) so we feel mighty blessed that we have some new friends to invite to our bday bbq. We'll setup in the front yard under the oak trees since it's supposed to be pretty hot today. 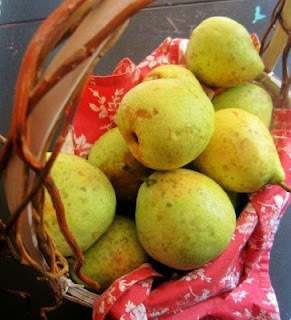 Wish I had some of those yummy lookin' pears! Thanks for your blog, I appreciate it. We headed out to a local transportation museum today with our kids.... had a blast!! love reading your blog!! My husband spent labor Day replacing a leaking kitchen faucet ! Yeah!!! He saves us hundreds by doing the "labor" himself . We bought the faucet at Loews . I did not have a Loews discount coupon , but I did have a competitors coupon , which they honored for a $20 savings ! We ended the day with homemade "saltless" ( my dietary restriction ) burgers , they were really yummy thanks to Mrs. Dash seasoning. All while putting bbque for dinner on the table for supper - I've managed to meet all of my goals - You must've been in secret prayer for me - I do appreciate - I had lots of energy - and still do - thank you!